Filmmaker Rituparno Ghosh passed away earlier this year just after completing the shooting of his film on Byomkesh Bakshi. The makers have completed the film and it is ready for release. It’s based on “Chorabali” by Sharadindu Bandyopadhyay. 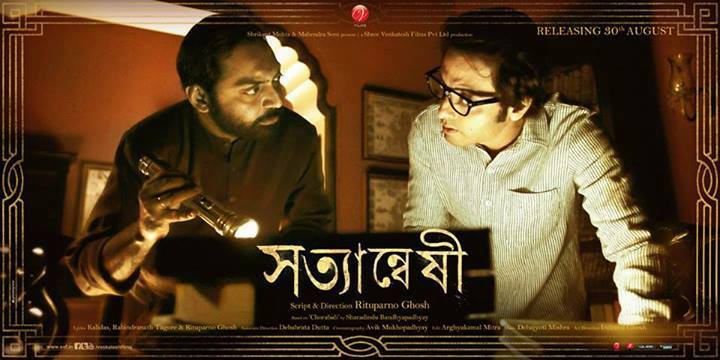 The film also marks the acting debut of filmmaker Sujoy Ghosh in the lead role of Byomkesh Bakshi. Official synopsis – Maharaja Arunangshu, the ruler of a princely sate named Balabantpur, had made a wish list on his death bed in the presence of Dewan Chandrashekhar, the family physician Kaligati and the High Priest. It laid down certain conditions for his heir, his son Himangshu. The first of which forbade Himangshu from marrying a non Hindu girl, and the second demanded a legitimate heir within three years of his marriage. Bound by his father’s conditions of succession, Himangshu is compelled to marry Alaka, an aspiring actress. A year and half into the marriage, Harinath, the young palace librarian disappears without any trace. This mystery occasions the arrival of the sleuth Byomkesh and his author friend Ajit to Balwantpur. The visit though is under the pretext of an invitation for a hunting expedition. In course of their stay, they unfold many secrets involving the residents of the palace and about the topography of Balwantpur.